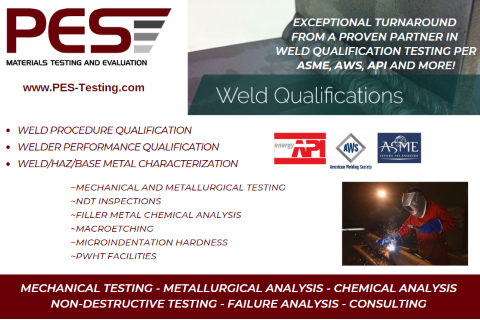 Exceptional Turnaround From A Proven Partner in Weld Qualification Testing…ASME, AWS, API, and more! Product Evaluation Systems (PES) is an independent testing laboratory located in Latrobe, PA. PES is a proven partner in materials testing and offers exceptional turnaround specializing in mechanical, metallurgical, chemical, and non-destructive testing and analysis. Since 1979, PES has been proud to offer exceptional personalized response to customer needs and our Rapid Response, Dependable Delivery continues to help our clients streamline the process of outsourcing their materials testing. PES is both NADCAP and ISO 17025 accredited and holds multiple customer accreditations such as GE Aviation, Pratt & Whitney (MCL), Rolls-Royce Aerospace (SABRe), and ATI Nuclear. Accreditation awarded to PES covers mechanical testing, test specimen preparation, metallography, chemical analysis, and non-destructive evaluation. Industry sectors include, but are not limited to, Aerospace, Additive Manufacturing (AM), Power Generation, Oil & Gas, Mining and Recovery/Reclamation.